Need to make your business more visible? Want to attract more customers? There’s a simple solution for that! Attractive, high-quality outdoor signs let people know who and where you are, and what it is you do. Our experienced team design powerful, stand-out signs for numerous business types and associations. From outdoor banners to neon storefront signs, Excel Signworks is able to create the ideal sign for you. Outdoor signage is the face of your business. Make yours stand out from the crowd and attract all the right kind of attention. Contact Excel Signworks today at (412) 365-4699 to arrange a Free Consultation with an Exterior Sign Specialist. Exterior signs for businesses differ case by case. Even storefront signage can vary wildly between similar stores. We take all this into consideration. During your free consultation, we’ll find out all we need to know about your business, your branding guidelines, your street presence, and what we can do to best attract attention to your brand and location. 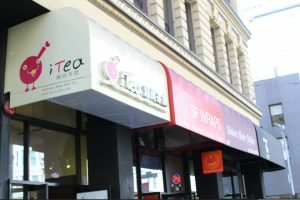 As the face of your business, it’s essential that your storefront sign reflects what you stand for. When your sign is reflective of your brand, it’s more likely to attract the right clientele. We’ll design a sign that’s suited to you. On top of that, it’ll be attractive, eye-catching and long-lasting, proudly displaying and promoting your brand long-term. 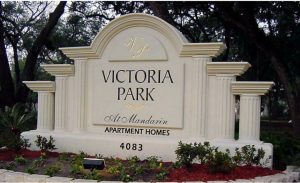 Channel letter signs are among our most popular outdoor signs. They’re created by fixing cut metal elements, such as letters, numbers and images to a backboard. Incredibly versatile, they can be used to spell out the business name and slogan. You can even incorporate your logo and other images into it. Easily customized, you can choose from a variety of colors, styles and sizes. Is your business open late? 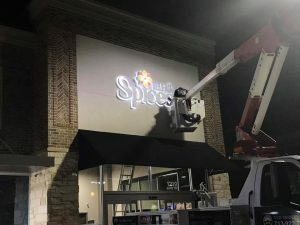 We also provide lighted exterior signs for those businesses that operate after dark. 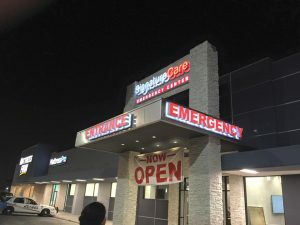 From interior lighted channel letters and cabinet signs to backlit dimensional lettering, we help you get attention in evening hours and poor weather conditions. 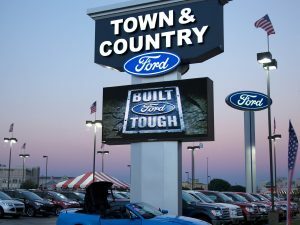 LED back-lighting keeps your outdoor signage shining out in any conditions. 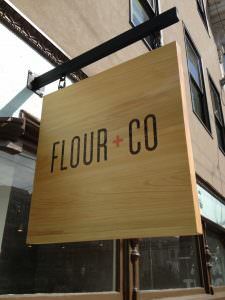 Our canopy signs offer a beautiful, boutique feel to your business. Popular with cafes and specialty shops, not only do they look great, but they also provide shelter from the elements. We typically use stretched canvas on our awning signs. However, we’re happy to adapt to your needs, and have made signs for many different types of canopies and awnings. Monumental by name, and design. Monument signs create an impressive first impression for any business. Custom made and carved from stone or marble, they’re ideally situated at the entrance to your company. Our monument signs are large, permanent structures. We believe they scream quality and durability – your customers will too. Stand out and above your competition with a towering pole sign. 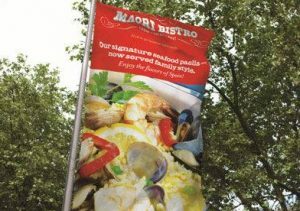 Mounted upon a tall pole, these signs represent the ultimate in business visibility. They’re ideal for reaching customers from far away, and are often used to attract customers from interstates, highways, and busy roadways. Standing taller than typical exterior signage, they give your business a real edge. We often see pole signs and pylon signs at car dealerships, gas stations, fast food restaurants, shopping centers, and grocery stores. Exterior signage comes in many shapes and sizes. 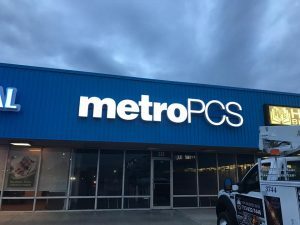 From simple outdoor banners to outdoor digital signs, every business can benefit from attractive, promotional outdoor signage that promotes their products, services, and brand. As well as our vast range of storefront signs, we’re able to create the perfect custom promotional signs for your business. Whether you want a matching set of neon signs to compliment your bar or a simple yard sign, Excel Signworks is here to help. 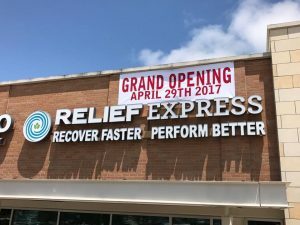 We also create cohesive indoor signs, vinyl signs, vehicle wraps, and custom signs for a complete business branding solution! Here at Excel Signworks, we don’t just make signs. We offer a full-service, with your needs and desires our top priority. From the very first consultation, we’re with you every step of the way. We’ll design, manufacture, install and even maintain your signs. Our exterior signage service is flexible and effective. We can create signs to match your existing signage if required. Otherwise, our designers are happy to create something from scratch. If there are any ideas you have, we will strive to incorporate them. You are in control the entire way, and we won’t begin manufacturing until you have given the go-ahead. We use high-quality materials and the latest technology to create all our exterior signs. Manufactured right here in Pittsburgh, there are no long waits. Once complete, our team of expert installers will ensure your sign is safe and secure. Fitted properly, it will stand the test of time. As the face of your business, it’s vital that you get your outdoor signs right. Contact Excel Signworks today at (412) 365-4699 to arrange a Free Consultation with an Exterior Sign Expert.